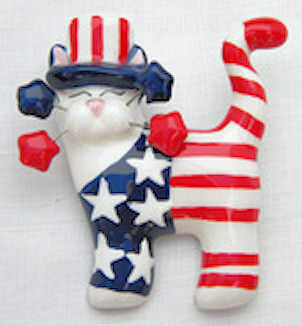 "I'm a Yankee Doodle Dandy, Yankee Doodle do or die...."
This jolly little kitty is not afraid to show his colors and his pride in America. He makes a great gift for either your men (magnet) or women (pin) friends and a wonderful one for you too!. Lovingly created by artist Amy Lacombe of Los Angeles, he stands 2 1/4 inches tall, ready to be yours. Choose this lovingly created figurine as a magnet or a pin (or both).